Curtain Call Challenge – Bouquet! It’s time for a new Curtain Call Inspiration Challenge! We have a new sponsor, Penny Black, for the Curtain Call Inspiration: Bouquet! 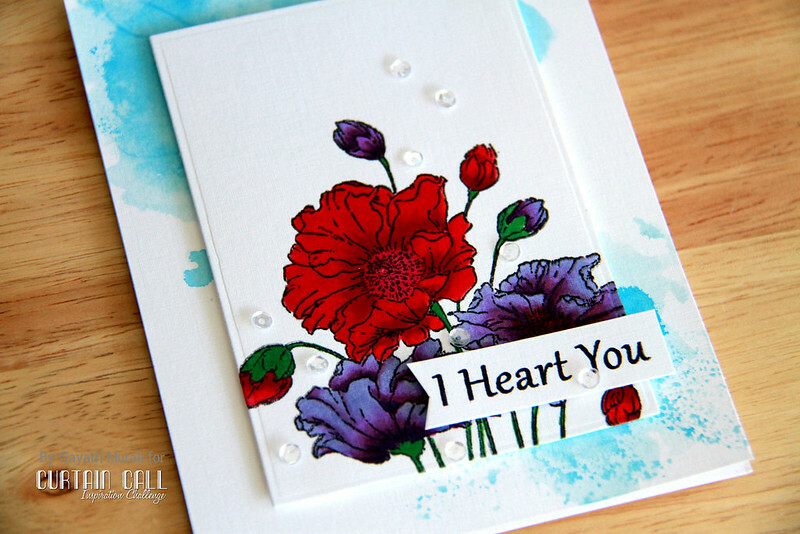 A randomly selected participant in the Bouquet challenge will have their choice of a Penny Black gift certificate, while the LEAD will be invited as a Guest Designer in a future challenge! I have used Penny Black’s Fresh stamp set on my card. I stamped the flowers with Memento Black Ink and copic coloured them. I picked the colours from the challenge graphics. LOVE the vibrant colours of pinks and purples. I then die cut a rectangle panel out of the coloured floral image to be used as focal point. For the background, I did the smooshing technique on regular cardstock. I used Tumbled Glass and Salty Ocean distress inks instead of watercolour on a piece of acetate sheet, then sprayed with water and smooshed it on the card front on the top left and bottom right. Love the subtle, layered colour wash effect this technique gives. As part of Penny Black Designer Program, I have an extra giveaway for Curtain Call Challenge Fans. All you need to do is to LIKE Penny Black Facebook page and tell them we at Curtain Call Challenge sent you. A random winner will receive $25 gift certificate from Penny Black. How cool is that? Make sure you visit each of the designers’ blogs for more inspiration! 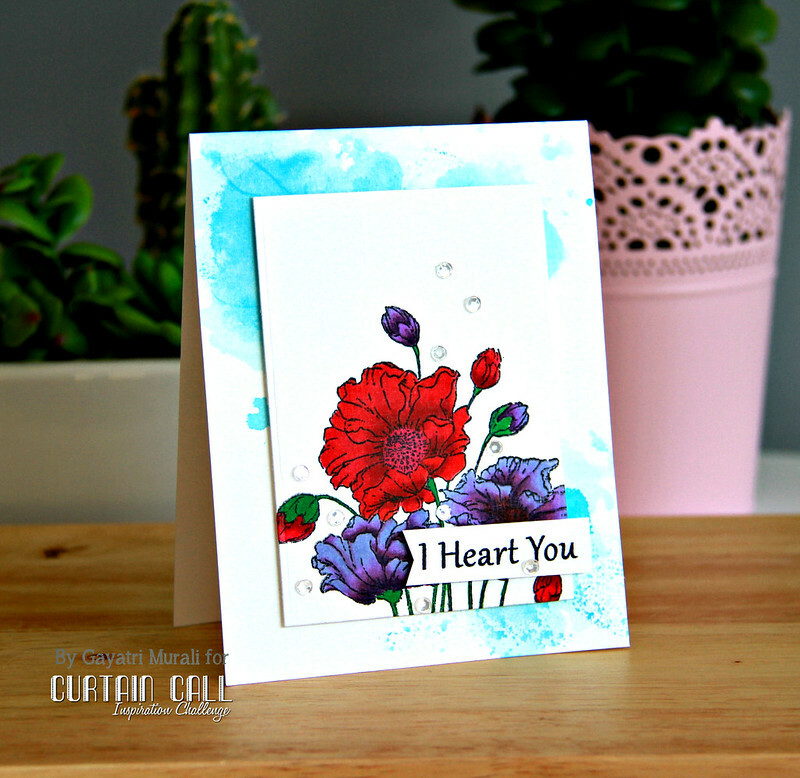 Stop by the Curtain Call Inspiration Challenge: Bouquet for the challenge details and to play along with us! 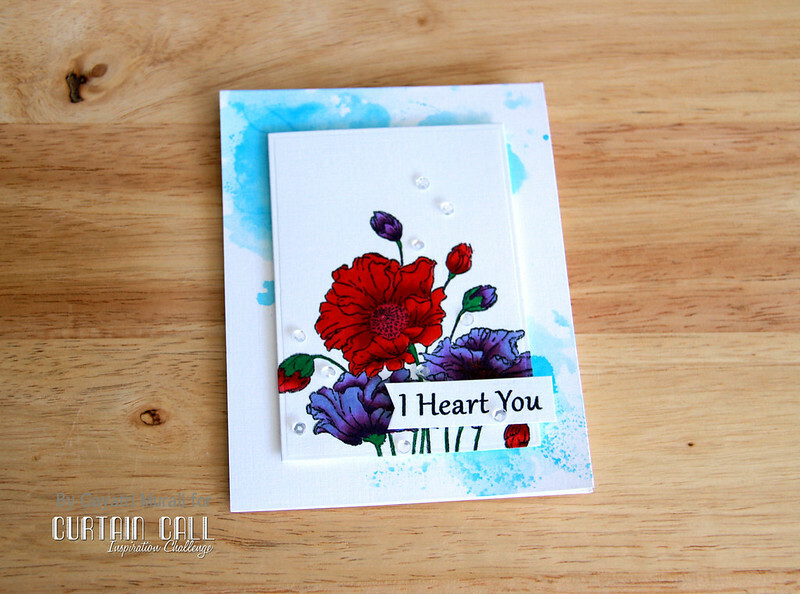 these deep colors in your card are so pretty and eye catching! This is beautiful Gayatri!! I love the deep rich colors! WOW the flowers are just incredible Gayari The colours are so intense. Adore those dark, rich colours and the fabulous splashes of blue in the BG. Gorgeous card. Wonderfull is the one word.. that light blue smooshed background is just awesome..